This page is for ALL Stainless Steel Clamps. 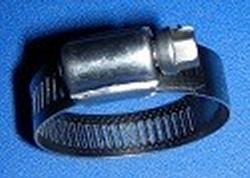 MOST hose clamps called "stainless" are not in fact all stainless. Only the band is stainless steel. The cage and screw are usually zinc plated. To us that is ridiculous. All our stainless steel clamps are stainless steel band, stainless steel cage and stainless steel screw. (All on this page.) We also have other types of clamps at the bottom of this page.